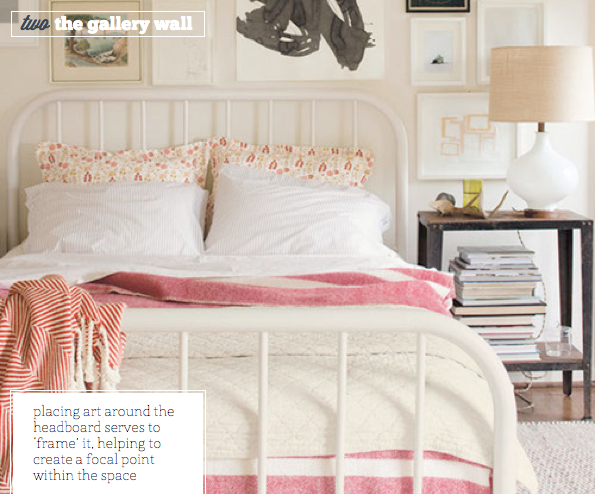 For the first three ways of 2012 I thought I'd pull together some ideas for guest bedrooms. Perhaps you had guests to stay over the holidays and realised the spare room wasn't quite up to scratch. Or maybe you're looking for a project to work on during the weekends. Either way, here are three different ideas for adding interesting features to a guest bedroom. First up we see how a twin bedroom doesn't have to feel childlike; the use of smouldering grey hues, vintage lighting and luxe textiles creates an inviting and adult scheme. Secondly, we see a fresh and feminine guest bedroom which is a fine example of how a gallery wall can work to frame a simple headboard. (I must add, I love the bedside table in this space!) Finally, the third bedroom provides inspiration for contrasting hues. Given a guest bedroom is only ever a temporary space, why not dabble into something a little more daring than your usual decor? I think this charcoal and mustard combo is a real winner. Which space gets your vote? I'm liking the contrasting colors bedroom and also the pattern mixing on that bed. I live in an NYC sized 1BR so no guest room to decorate but it's always nice to admire. Happy 2012! I'd pick the 3rd one though i'd paint the bed bright blue instead of yellow but i'm in LOVE LOVE LOVE with the quilt in the 3rd pic. Def love the charcoal and mustard!! Love this! #1 is my pick. The masculine accents with the feminine tufted beds are just too perfect!! That twin room is perfection, a great mix of neutrals to create the perfect cosy bedroom! I adore the twin bedroom. I gravitate towards timeless and classic appeal and that room offers it to perfection! I love them all and couldn't agree more, our guest bedroom has been neglected. *inhale* The beds in the first one, the lamp in the second one, and the bedding in the third one. Perfection, all! Happy New Year, Dub! I think I would like a combo of 1 and 2 with dash of 3 please. oh, i go with #2, for sure. it gives so much for guests to look at! I LOVE the second one! As you noted, the bedside table with the books is fab, and I love the touches of pink, plus I'm always in love with gallery walls in any context. I wish I had a guest bedroom to decorate! Someday. I usually go for white walls with shots of vibrant colour but I am totally smitten by the mustard (incidentally, one of my favourite colours) against the charcoal wall!!! Who knew the industrial look could evoke a sense of cosiness? I love it so much that I just might replicate it in my guest bedroom! I am drawn to picture no. 2. But they all seem damn good! I like bits from all of them. I totally agree about being a bit bold in a guest room. We have a very strong Suzy Hoodless wallpaper in ours, but I must admit that I slightly regret not using it in our bedroom instead! We come here often but never say a peep, but 'smouldering' grabbed our attention - great word! I vote for cntrast colour! It's my favorite! love it! a great room to play with a bit - what beautiful inspiration! Much to my surprise, it's no 3 for me! Maybe it's the simple charm of the grey and turquoise, or just the wool blankets at the end of the bed that swung it for me! I'm a huge fan of Schoolhouse Electric Company's new line of furnishings and textiles... glad to see you are too! I am working on a similar gallery wall around our headboard, so I guess my vote goes to room #2, although I love all three! I pick the top one! 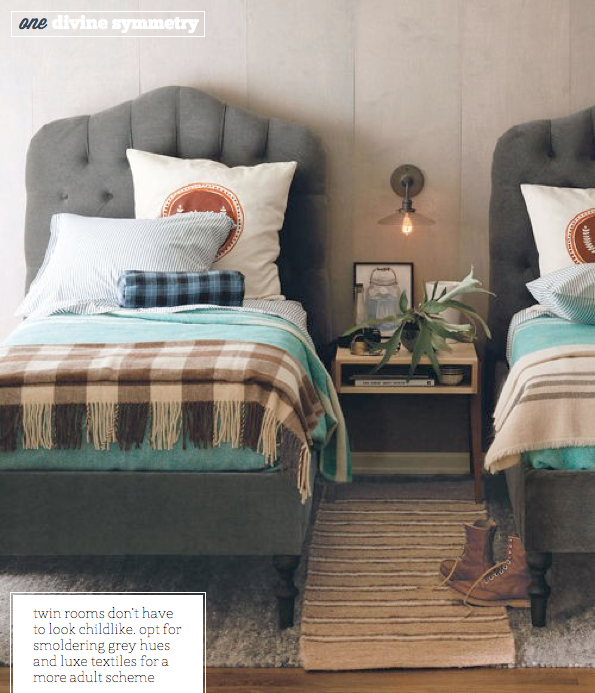 Love the button tufted headboards and the cozy feel! 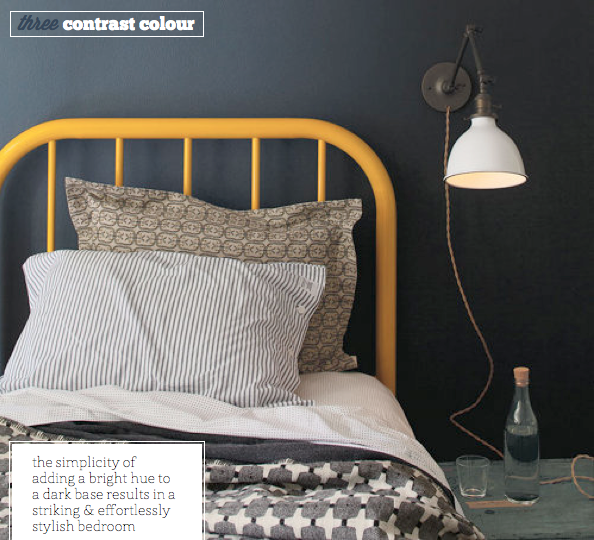 Count me in for the last bedroom - love the colour combo! I am loving the first guest room, it's slightly masculine, interesting and rugged! def the first one..love the wooly blankets. and the color palette is so inviting! No hesitation on this one - definitely number 3 for me. Grey and yellow is my absolute favourite colour combination.